NEI Motorsports riders Michael Pearson continues to make good progress towards his road to recovery after his serious accident in the Czech Republic’s Horice Road Races reported Willis Marshall, spokesperson for the Pearson team. 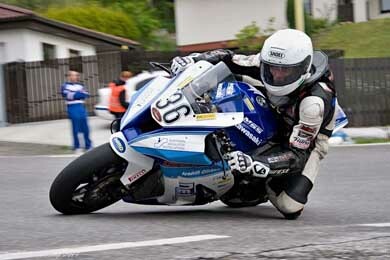 Racer Michael Pearson continues to improve following his serious accident. He said: “Michael, who underwent a seven hour operation on his lower back last Thursday, is hopeful to return to Northern Ireland later this week where it is expected that he will be admitted to the Royal Victoria Hospital. “First indications are that his back operation has been a success, and that according to Doctor Havel in the Hradec Kralove Hospital in the Czech Republic, Michael should make a full recovery in due course. It was first thought that Michael had also a broken hip, but further scans on Michael last week have been inconclusive, and it is believed that there are no fractures in his hip. “Michael and his wife Diane, his mother and father, team members, and all at NEI Motorsports, have been overwhelmed by the gestures of good will, and kind donations to Michael’s recovery fund. Also to Marty Nutt and David Rea for their kind donation taken at last week’s World Superbike round at Donington Park, and to Davy McCartney for obtaining a collection at Mondello Park recently.